I talk a lot about the narrative theory of art, not so much about narrative theory as it relates to literature––which is strange if only because I teach English, and I’ve said in many places that I’m a writer first, and that I hate drawing and blah, blah, blah. 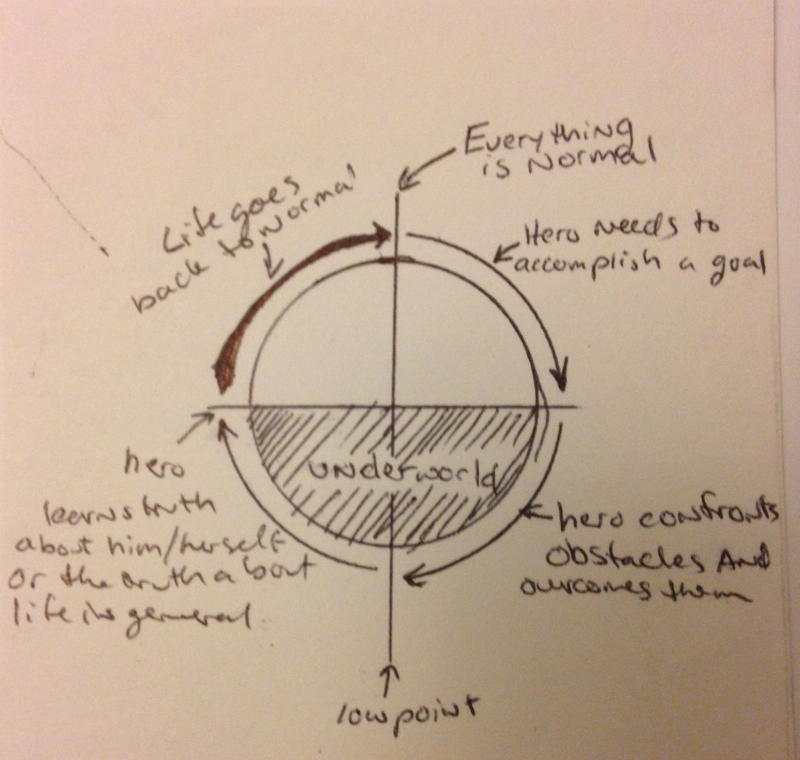 When it comes to story construction I’ve been heavily influenced by two approaches: the heroic circle and ring composition. I first learned of the heroic circle in my senior year of high school––a surprising development considering the class was taught by the baseball coach and the class was full of what I’ll affectionately call reprobates. What brought the surprising level of storycraft to the class was that the instructor was taking a night class in film studies and, really, instead of teaching English he regurgitated that week’s lesson to the class––and I actually learned something. 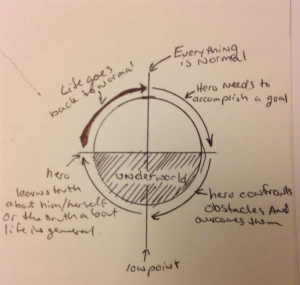 One of our papers required us to do an analysis of a film and apply the heroic circle to its structure. Being the dork that I am, I wrote mine on Sam Raimi’s Army of Darkness (his third installment of the Evil Dead franchise). 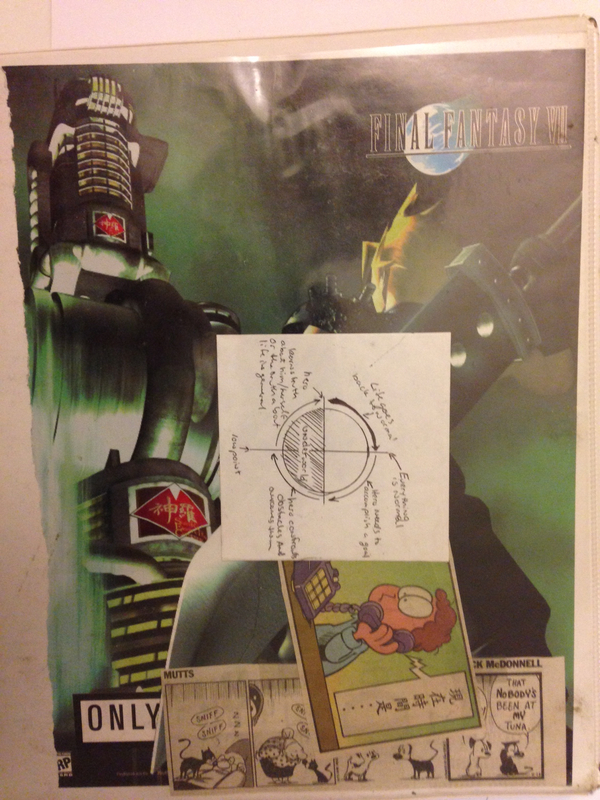 My notes on the Heroic Circle from 1997, preserved in a clear sleeve of a three-ring binder. I was really impressed by the idea of change that the heroic circle (outlined by Joseph Campbell) brought––that the circle represents a variety of things. Not only is it the course of the plot (the hero starts in the world of the familiar before descending into a literal or figurative “underworld” before being able to come back to the familiar to deal with whatever caused the inciting incident), but it’s also a barometer for character types. In theory, if a character starts at the top of his circle of fortune, he or she must hit the bottom at some point and can come back to the top, but they must be changed by the experience––it’s not the same point that it was at the beginning of the story, but it’s similar. My heroic circle notes in front of a Final Fantasy VII ad and cut outs of Garfield and Mutts strips.. I liked the necessary darkness and psychological implications of the circle and I even cut out the circle diagram and slipped it into the clear plastic cover of my binder for the rest of that school year (just a small square in the quilt of harvested bits of my teenage identity that adorned that binder––a Garfield cartoon, a Mutts strip, an ad for Final Fantasy VII on the back, and a printed-out signed photo (not to me) of Bruce Campbell from Army of Darkness, a clipping of the 1998 Godzilla monster (because, be it Godzilla or not, it’s a cool design), and a picture of my father in the 1970s on the other side) and I’ve always tried to construct stories––especially ones that I wanted to be epic and huge and heroic––with the circle in mind. 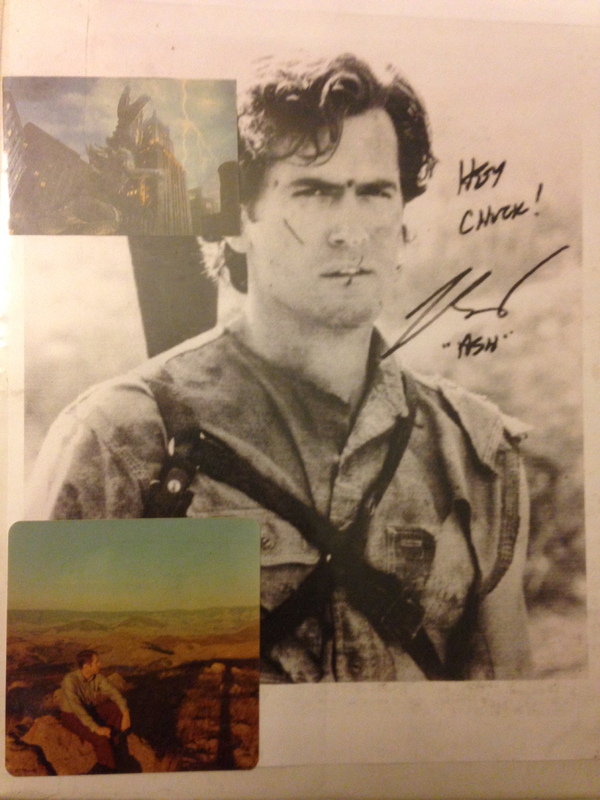 The front of the binder: the printed out photo of Bruce Campbell, the cutout of ’98 Godzilla, and the picture of my father somewhere looking at something. In college, while taking a “Great Books” class, I was taught the ancient format of “ring composition” which is more formally known as a chiastic structure. It’s a more macro approach to storytelling than the heroic circle, but I feel it has more in common with songwriting than it does traditional story plotting. It involves the repetition of ideas later in the story that complement, or even mirror, elements at the beginning of the story. It’s used in texts as ancient as Homer (which was how I really learned about and applied it) and biblical texts, through to Milton’s Paradise Lost and Shakespeare. Both of these narrative ideas––the heroic circle and ring composition––were in play during the development of Long John, but that doesn’t make it any better or worse or important. 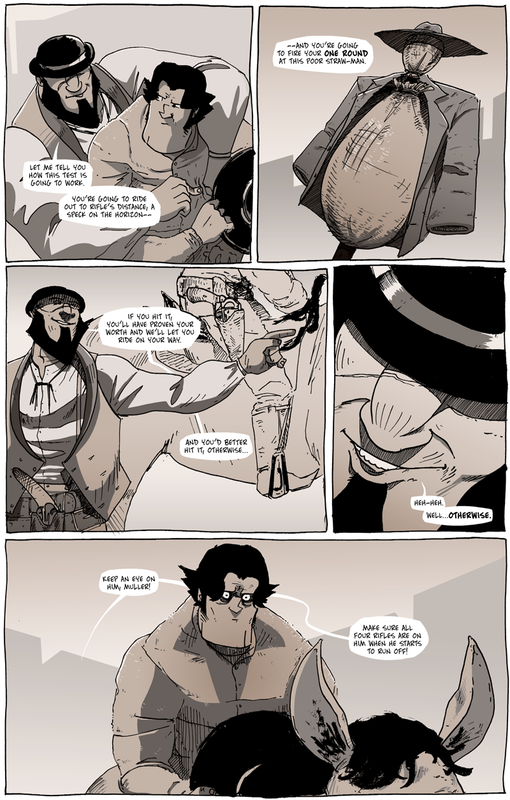 I turn to these things to keep me on track and to keep things interesting for me as I put the comic together and to again show that, despite it being a comic about a cowboy running around in his underwear, I really enjoy putting everything into telling this story. Whether it adds any depth, I don’t know. I at least hope that the story is fun.